There are many subject matters which can be exercised in a movie. Some of them may reach to a wider audience, but some of them only to the right one. Kong: Skull Island is a perfect fit for any audience, excluding age fourteen and below. It is action packed, has all sort of characters and one in particular that steals the entire show, lizards, different kind of creatures and Kong, the King himself. You see, my curious reader, there is no way a movie like this would ever fail… Not this one, nope, not at all. Goodman shows up at Senator’s office asking for permission to travel to an unknown island, a place worse than the Bermuda triangle. At first, when a negative answer comes, an idea that the Russians should never put their feet in an uncharted island makes him change the mind. The best people are gathered together to embark on a mission where most of them won’t come out of it alive. But their findings will leave them stunned, in fear, in great danger and uncertainty if they will be alive the next second. 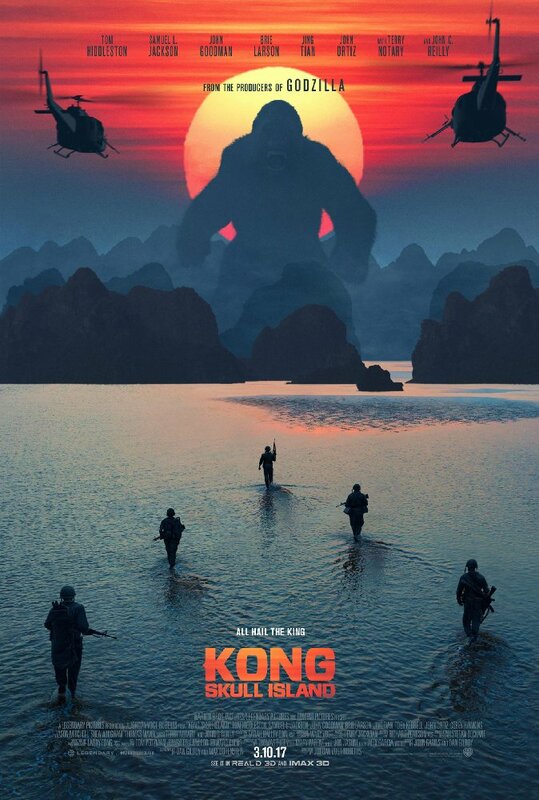 It’s all because they have to face not only Kong, but all other creatures and beasts that simply cannot be killed easily. Kong: Skull Island, however, has a human villain as well – Preston Packard (Samuel L. Jackson). You obviously can justify his actions, as a half of his troop gets killed by Kong before they even touch the land. But soon the man goes mad in such a way that he takes the soldiers with him to join a fight they can’t win. The movie has a lead female character as well, and that is Brie Larson’s Mason Weaver, whose only weapon is photo camera. Tom Huddleston portrays a man, James Conrad who gets paid an insane amount of money to lead the mission but soon will find that he might not get a chance to spend them, as he may die before he puts his hand on the money. And yet there’s a funny, a-show-stealer, charismatic and the most interesting lost and found character, Hank Marlow (John C. Reilly), with whom you will fall in love with. As it usually happens with these types of movies, it has good and bad parts. But I’ll be damned if this one had any break from sensation. It’s a massive movie, with stunning visual effects, gorgeous fighting scenes between Kong and lizards and well acted? Oh yes it was. You will even drop some tears during the closing scenes, as it was charming, sweet like a candy. The movie directed by Jordan Vogt-Roberts is absolutely full of fun. It’s engaging from the beginning to the end. It grabs your attention and won’t let you go till the end. It’s a special treat when you see at an IMAX 3D, as some sceneries are breathtaking. To conclude, Kong is an excellent movie to be seen. It’s a great addition to the Kong family that won’t disappoint you. Simply see it, and tell me afterwards if I was wrong.